Rufus, a white kitten with brown and black spots, was last seen in the Garapan area just north of Garapan Elementary School on Thursday afternoon. If you find him, please contact Eden Blanco at (670) 789-8621. Thank you! PAWS will be hosting a general meeting, open to the public, on Thursday, July 29, 2010, at Shenanigan's in Garapan at 5:30 p.m.. The purpose of the meeting is to solicit volunteers for the organization. Currently, PAWS is undergoing a change in board members. President Katie Busenkell will be resigning in mid-August because she is moving off-island. Board Member Ron Smith will also be resigning in order to pursue other volunteer commitments. The only board member remaining with the organization will be Bobbi Grizzard, who has acted as Treasurer since 1993 when the organization was first established. "I'm not leaving the organization or closing its doors," said Bobbi Grizzard. "We'll just have to limp along until new energy shows up on the island." 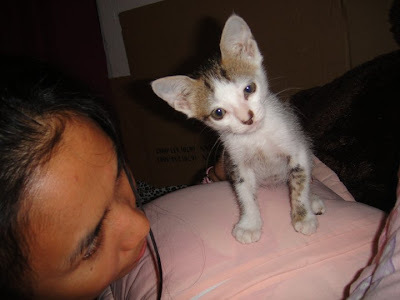 Volunteers are needed to answer calls to the PAWS hotline (285-PAWS), pick-up and/or advertise unwanted and abandoned animals, and reach out to the public. 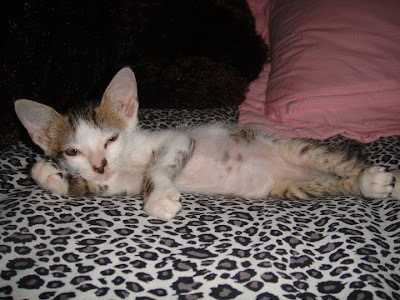 If you are interested in volunteering for PAWS, in any capacity, please call 285-PAWS, email Bobbi Grizzard at bobbi.grizzard@gmail.com, or simply come to the meeting at Shenanigan's on July 29, 2010, at 5:30 p.m. Whether trash or treasures, natural objects or man-made castaways, things that wash up on the shoreline can be fascinating. These objects are a window into what's happening beneath the waves, and in some cases, they give us important clues about things like currents, wildlife distribution and migrations, and human impacts on the ocean. What interesting objects have you seen on the beach? Post pictures of your finds here, and browse images of other interesting flotsam and jetsam. Please geo-tag your photos before sharing with the group (don't worry, it's easy, and it may help in identifiying mysterious objects and species.) And please use the tags "ocean trash" or "ocean treasure" to help identify your finds. When it comes to marine life and other natural objects, we encourage members of this group to practice the old adage: take only pictures, leave only footprints. I know there are near weekly beach cleanups taking place on Saipan. What are you guys finding? Upload it to Flickr and share it on the Ocean Trash & Treasures Flickr group to share it with the world. Visit the Smithsonian Ocean Portal for more. 4th of July Parade Clean Up - nearly 20,000 lbs of trash! Getting ready to set off on our second annual post-parade cleanup, a few of the volunteers stop for photo at STaR Water parking lot. 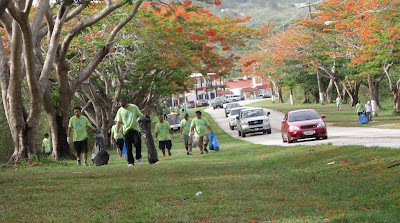 Others joined the cleanup along the way making the event a total success! All in all we figure their were about 25 volunteers more than doubling last year's numbers. Founding member Cinta Kaipat organizing with other volunteers as we all waited for the parade to get moving. Abe "Utu" Malae and Capt Robert Lorenz from the CUC set out as we begin to move. Several volunteers set out down the beach path. Keeping garbage out of our lagoon goes a long way towards preventing future marine debris. And we are off! Everyone is excited to see how many total pounds of trash will be collected along the parade route. MINA's Kathy Yuknavage is the project manager for a marine debris prevention project. 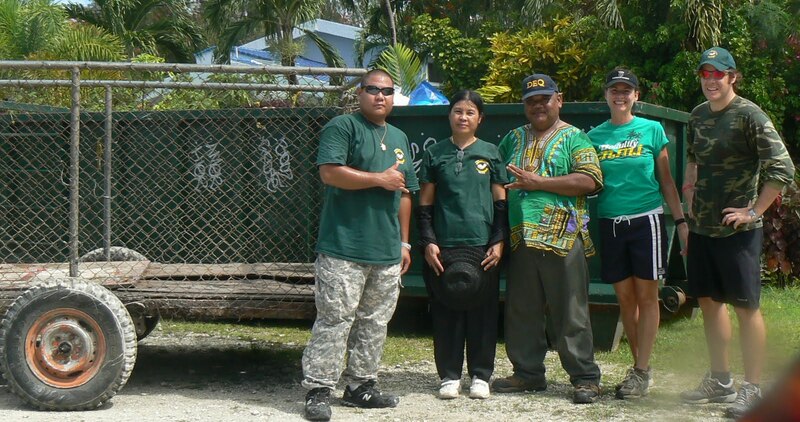 Under her direction, MINA has placed nine recycling and mixed waste bins at a number of Saipan beaches and parks over the last several months. A grant from NOAA provides funding for this project. Long time supporter and former Beautify CNMI! award winner Ken Kramer joined in the clean up. Heidi Yelin and Bryan Jones collecting trash from parade watchers and campers. Laurie Peterka donated her truck and time to help out again this year passing out over 200 garbage bags, many gloves and hauling a number of bags back to the waste bin at STaR Water. DEQ staff helped distribute supplies and interacted with parade watchers asking them to help dispose of their trash properly. DEQ's Max Simian drove one of the two trucks pulling trash collection trailers and helped take full bags of trash from campers. Both trash trailers were full by the time we finished! Slowly making our way along the parade route. It was hot, but occassionally we found respite under the trees while still picking up trash. As we got closer to the end of the parade route, we found more volunteers working well ahead of the trash trailers and supply trucks! So, how much is 20,000 lbs of trash? It's kind of hard to imagine, but this full bin gives you an idea! The height of the bin is about 5-feet tall and the length is about the same as a big Ford truck. Joe Kaipat, event organizer, is most pleased with the accomplishment of the day! 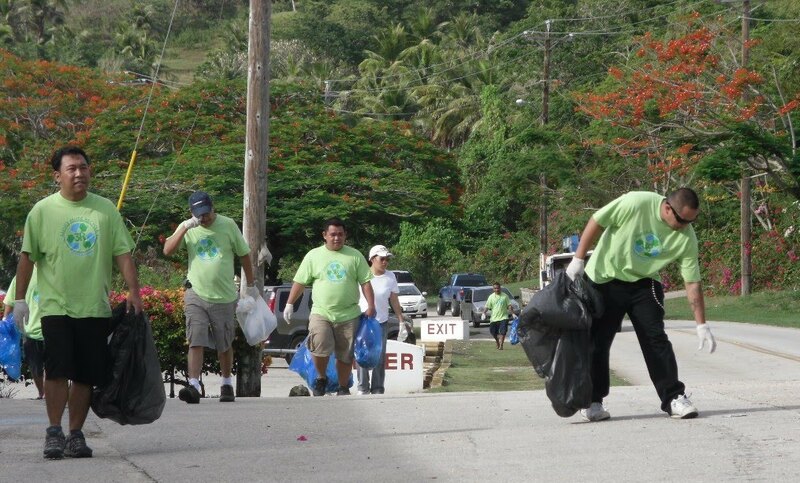 Trash is now in a bin and headed for proper disposal instead of littering our beaches --- thanks to all the Saipan parade go'ers who did their part to keep our beaches clean and our island beautiful! 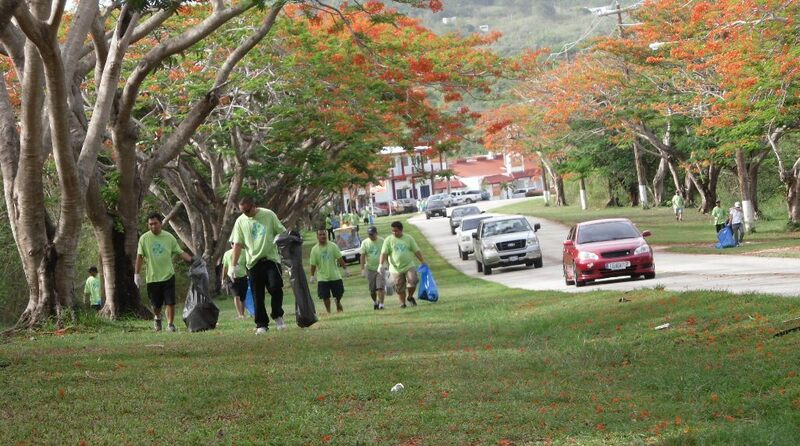 You did an awesome job and you have contributed to keeping our island healthy...good job! Special thanks to STaR Water for letting us use their parking lot as our launch point and their neighbors for letting us park a 20,000 lbs disposal bin in their lot. A big thanks too goes out to Artman for donating 200 garbage bags and to Saipan Ice & Water for their donation of water and ice for volunteers! Gloves and bags will be provided. Make sure you put on sunscreen, where a hat and bring some water. We will follow the parade for about 2-hours. Wear your Beautify CNMI! t-shirt (if you have one) or wear your organization's t-shirt to show your spirit! Comfortable shoes are recommended. There is a lot of walking! All campers were provided with two (2) bags as part of their camping permit and are encouraged to dispose of their trash at the waste bin in front of STaR Water.